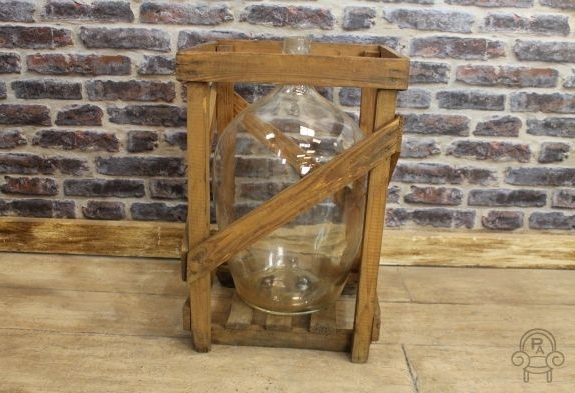 This is a great opportunity to purchase some traditionally made 1930s vintage wooden bottle crates. 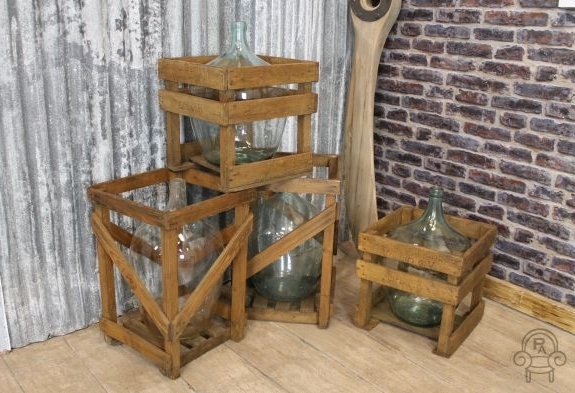 These urban style retro bottle crates would be a lovely feature for any bistro bar, large country kitchen or any retro or vintage themed interior. 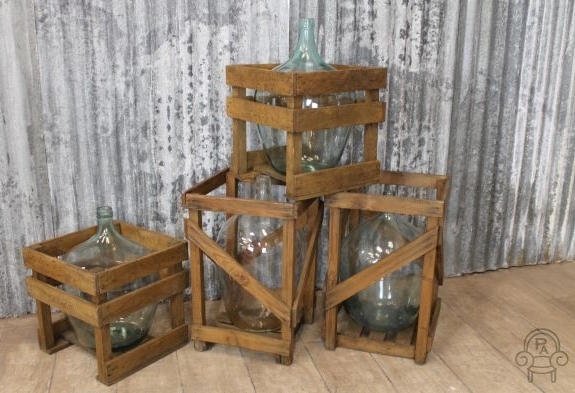 These retro bottle crates are being sold individually; they come complete with clean bottles and have all been hand waxed. 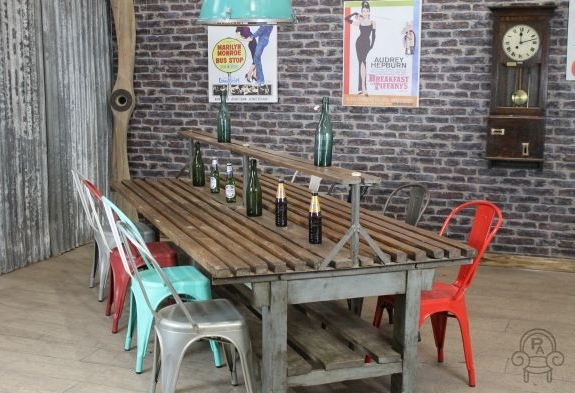 Please note the other items photographed are not included in the listing but are available to purchase separately. 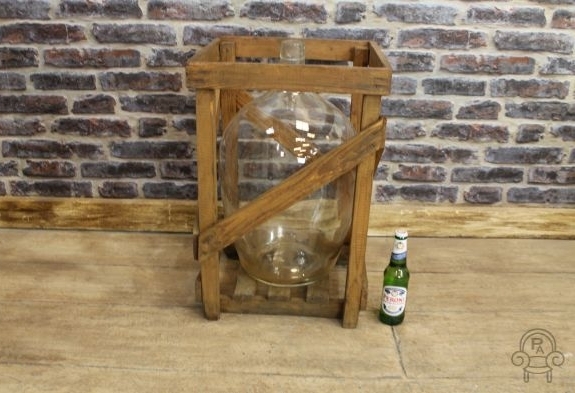 Please note this listing is for one of our retro bottle crates only. 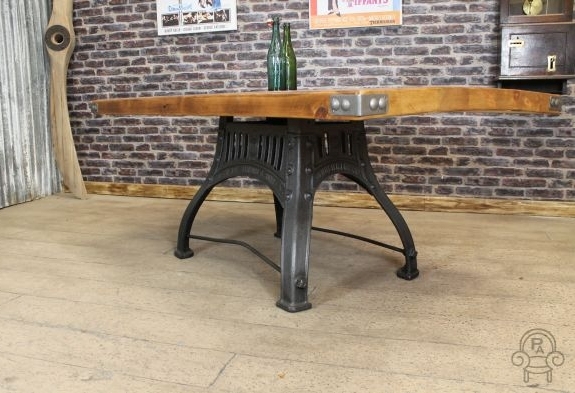 This large rustic style industrial kitchen table is a fantastic addition to our wide range of industrial and vintage style furniture. 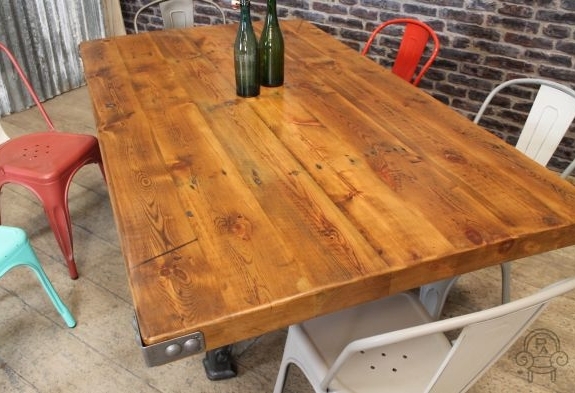 This original table has a 50mm thick reclaimed pine top, which gives it a lovely rustic appearance. 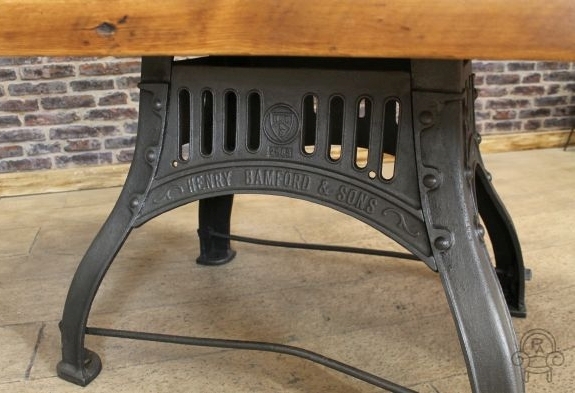 The dining table boasts a unique cast iron base, which adds to its urban character and charm. 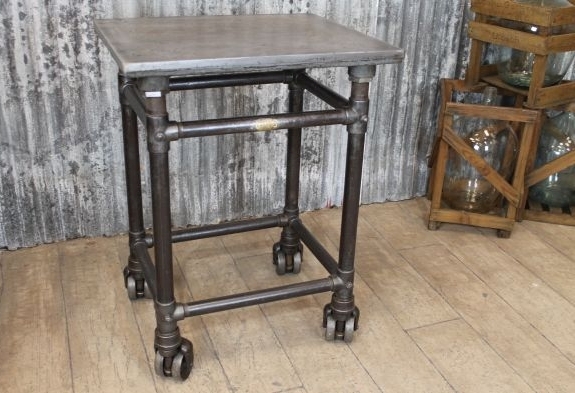 This industrial kitchen table would make a great statement piece for a vintage style bistro bar or restaurant, or equally as a feature in a large country kitchen. 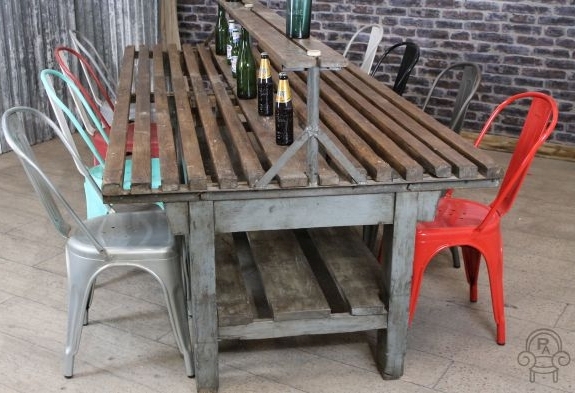 Please note, the other items pictured are not included in this listing. 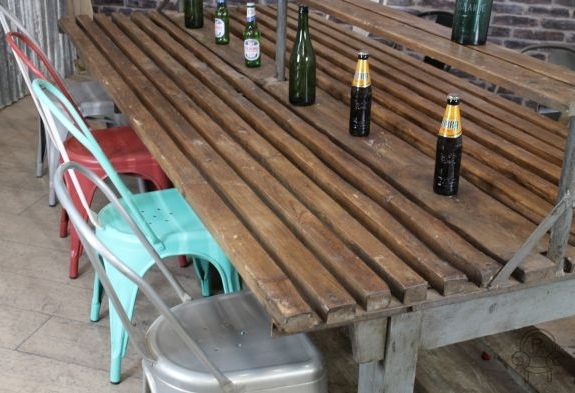 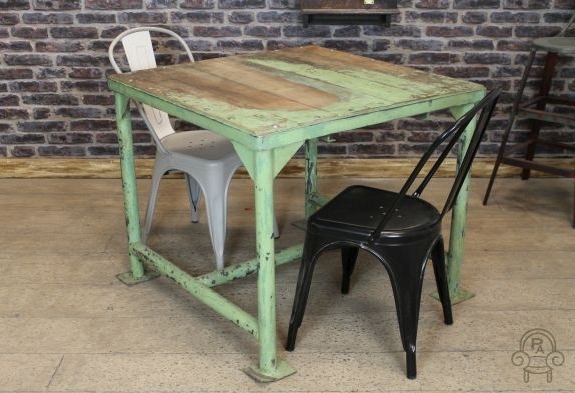 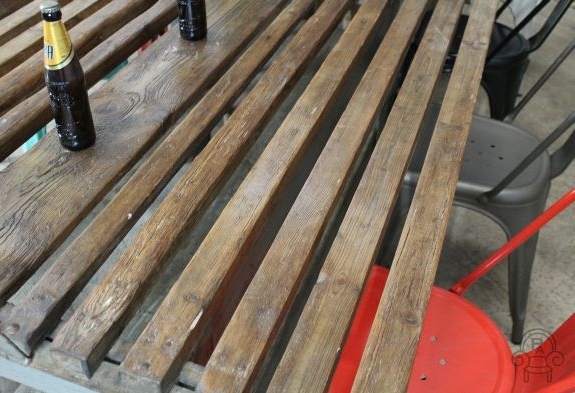 This lovely industrial restaurant table is an excellent example of a piece of classic industrial style furniture. 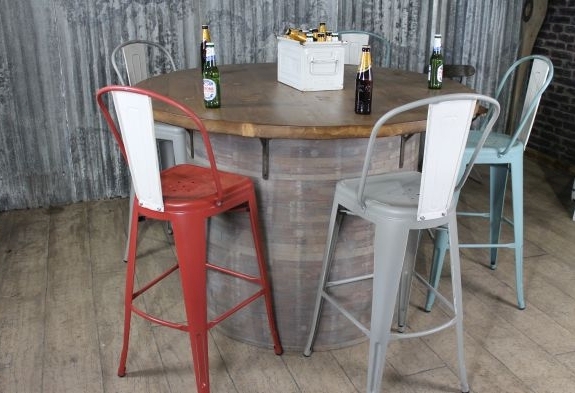 This fantastic fruit packing table, produced from steel and timber, would make a lovely feature for any large wine bar, restaurant or commercial property. 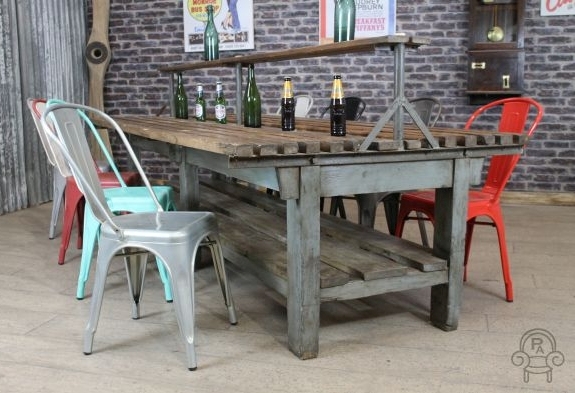 The industrial restaurant table can easily seat 8 – 10 people, and with its central shelf would be perfect for serving tapas, drinks, starters, etc. 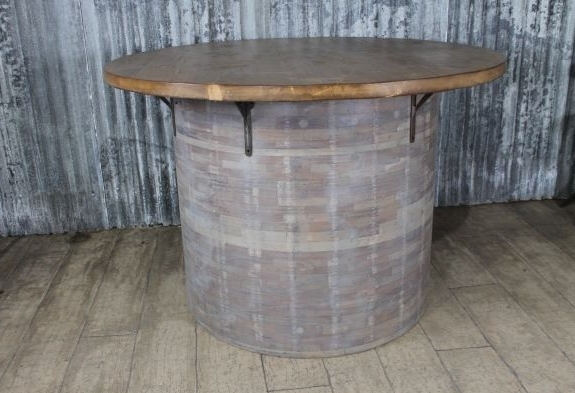 This rustic table would be a real focal point in any restaurant. 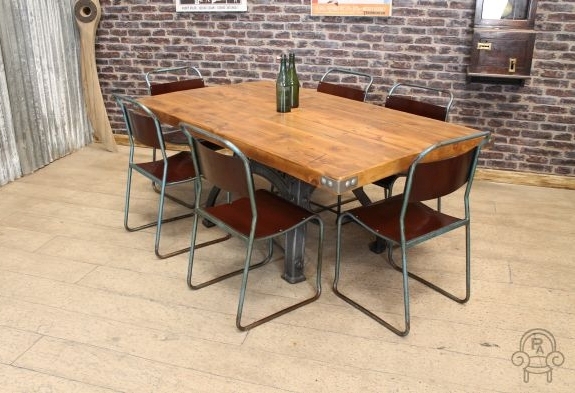 As you can see, we have featured this wonderful table with a selection of the large range of industrial style chairs that we also offer. 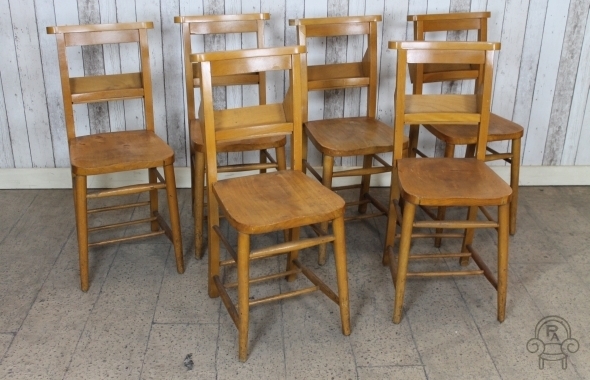 Please note, the chairs and other items pictured are not included in this listing but are available to purchase separately. 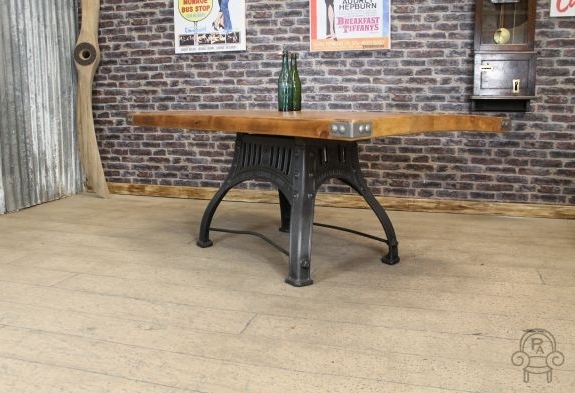 This wonderful rustic industrial table is an excellent addition to our range of industrial and vintage style furniture. 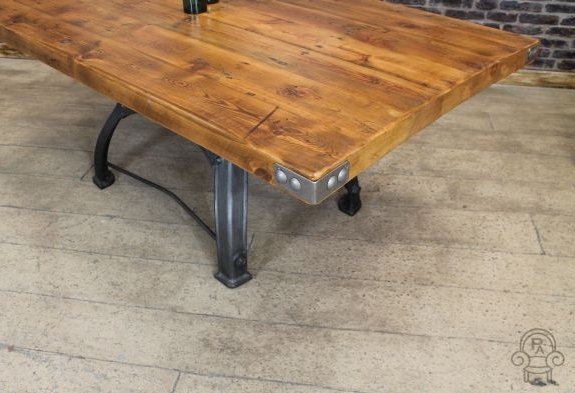 This industrial style ‘meet and greet’ factory table features a solid beech top, with raised steel coach bolts. 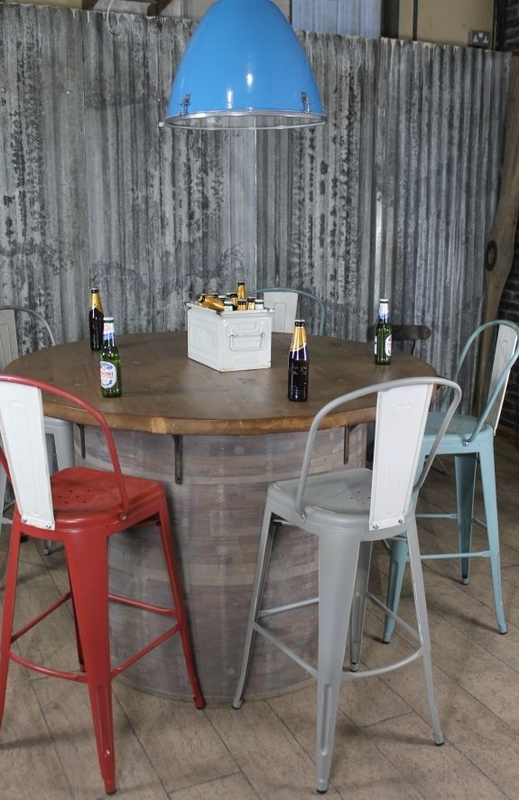 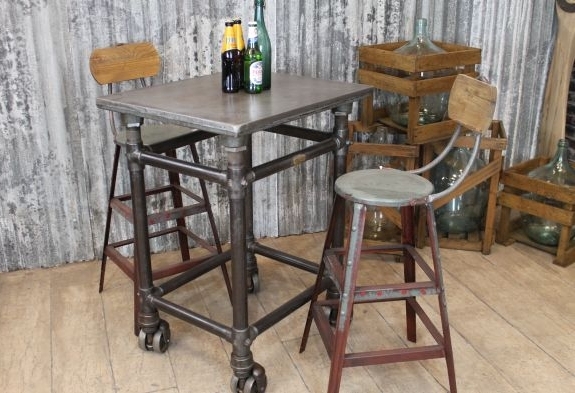 The rustic industrial table has a worn paint finish and tubeless steel construction giving it a unique vintage look, which would suit any urban warehouse or industrial style interior. 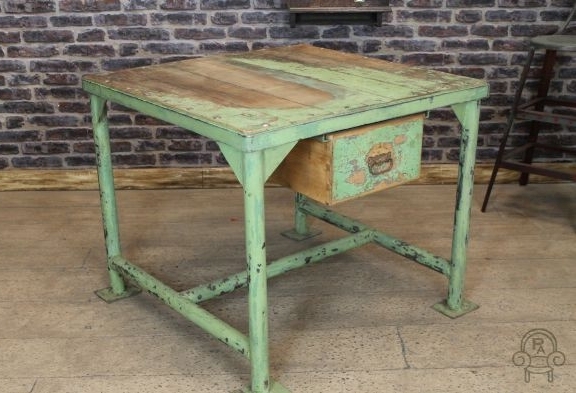 The rustic industrial table has a drawer, which can easily be removed, giving the piece a number of potential functions as a dining table, computer table, meet and greet table, or somewhere to place a cash register. 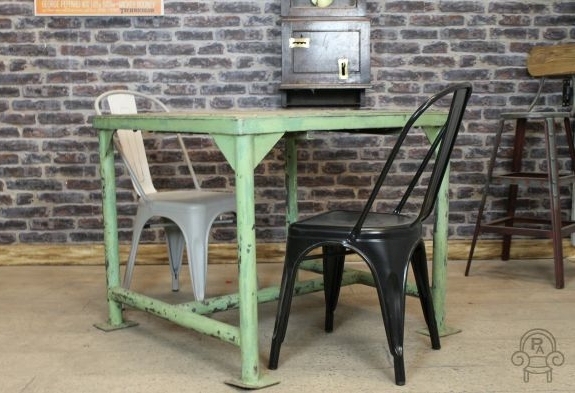 This lovely item of versatile furniture is extremely heavy, substantial and stylish. 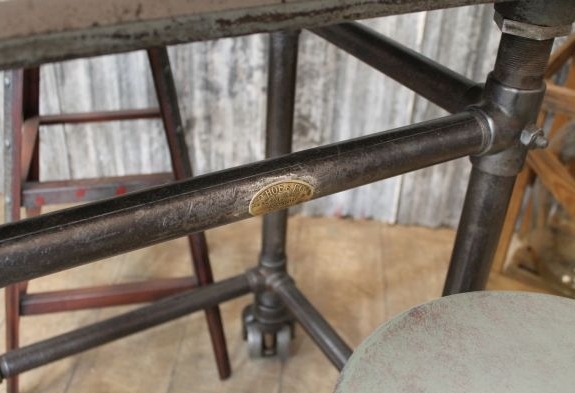 Please note, the other items photographed are not included in this listing but are available to purchase separately. 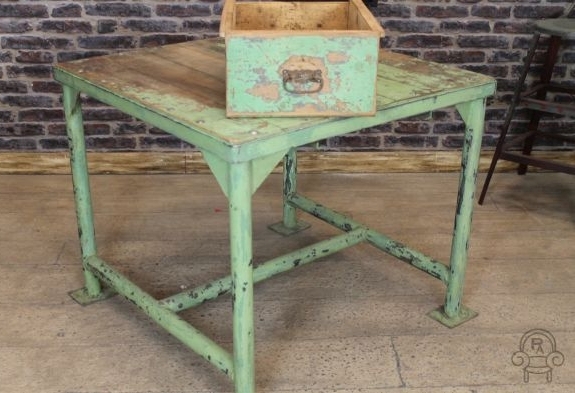 This lovely original 1930s vintage industrial sideboard is a fantastic addition to our extensive collection of industrial and vintage style furniture. 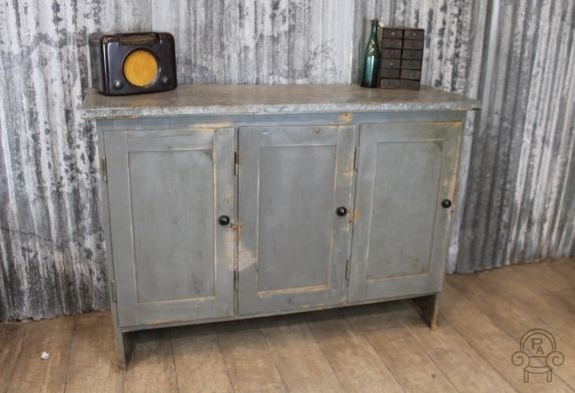 The zinc and pine sideboard / cupboard features a lovely solid pine base with original grey distressed paintwork, and a warm zinc top. 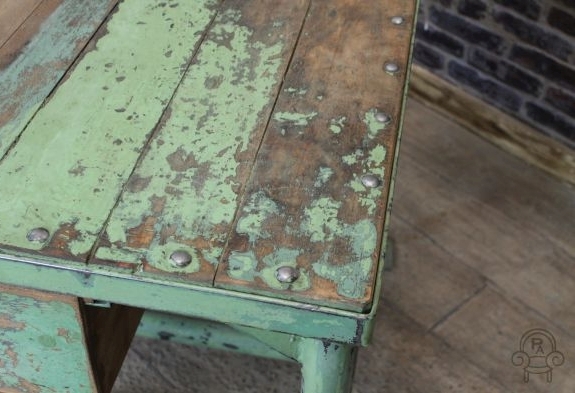 This vintage industrial sideboard is in a good condition, as you can see from the top it does have marks and blemishes, which we feel only adds to its character and charm. 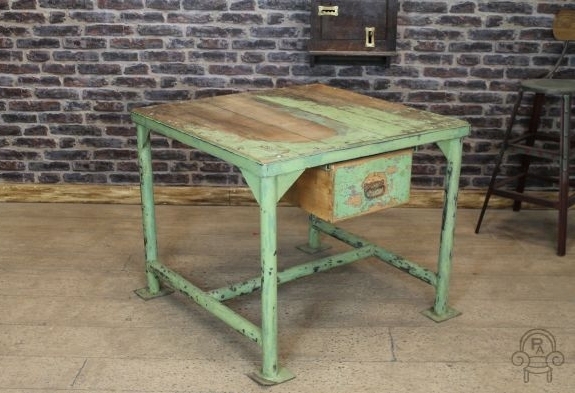 This is a brilliant item of furniture for any vintage or urban inspired interior. 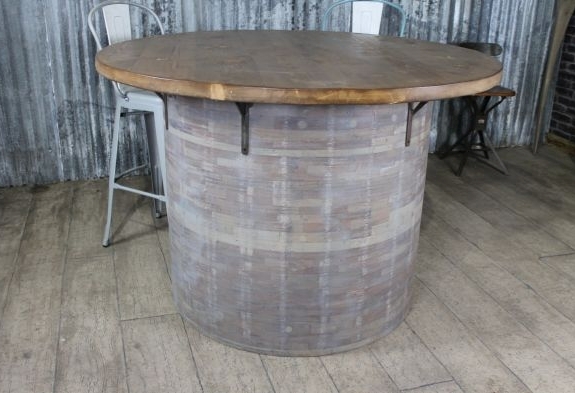 Please note other items displayed in this listing are not included. 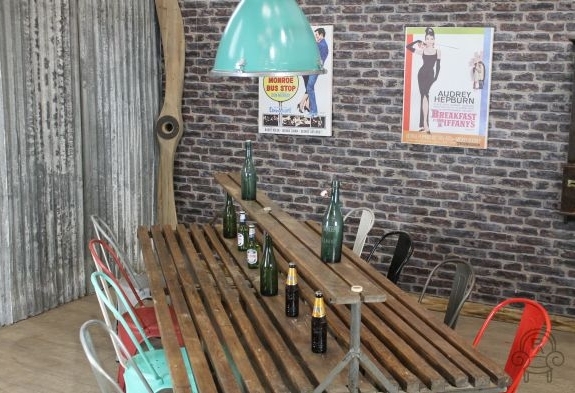 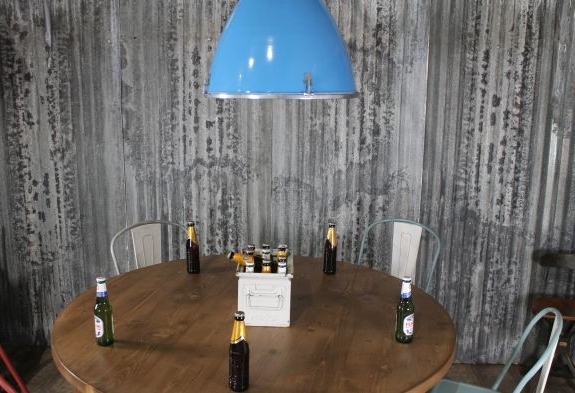 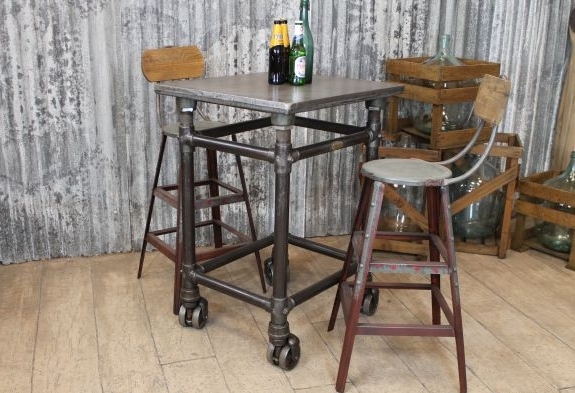 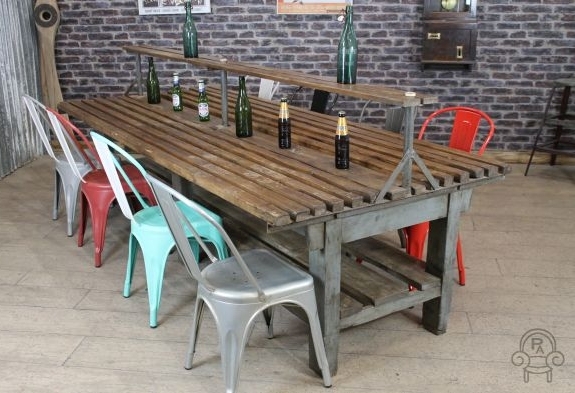 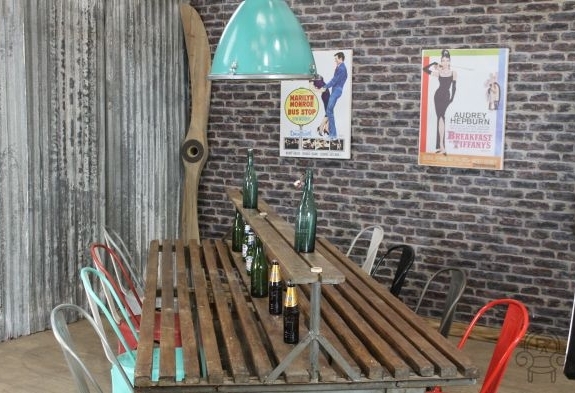 This large industrial style bar table is an excellent addition to our collection of vintage furniture. 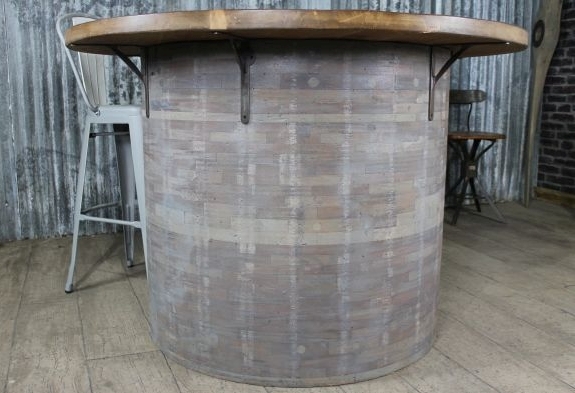 This poseur table features a reclaimed pine top, which stands upon a circular base made from individual wooden blocks. 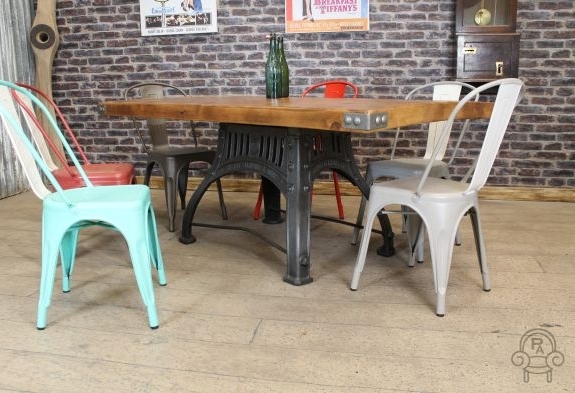 The table is decorated with cast iron angle brackets and would be ideal for bistros, restaurants, bars or cafes. 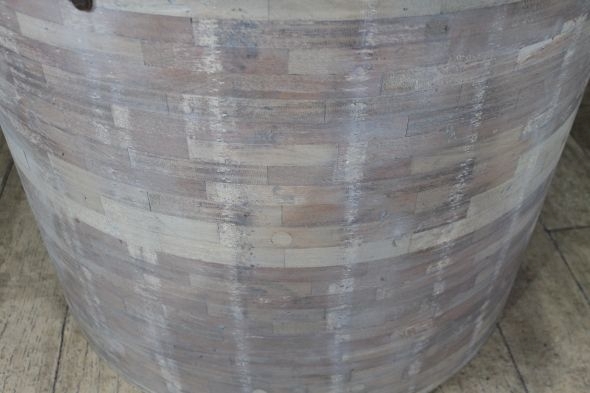 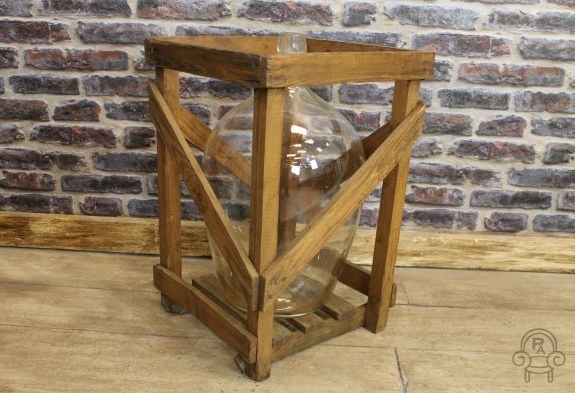 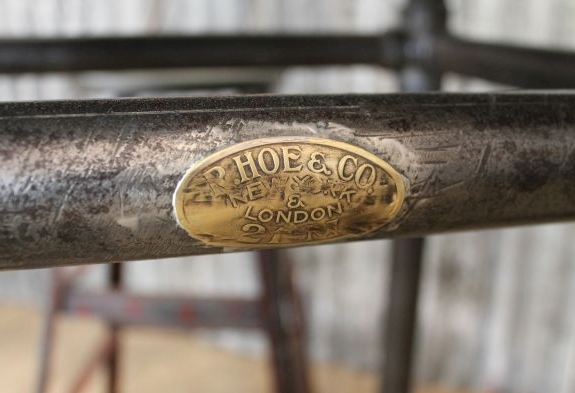 This item would make a fantastic focal point for any industrial themed interior, and is available with a natural timber base or grey oil finish. 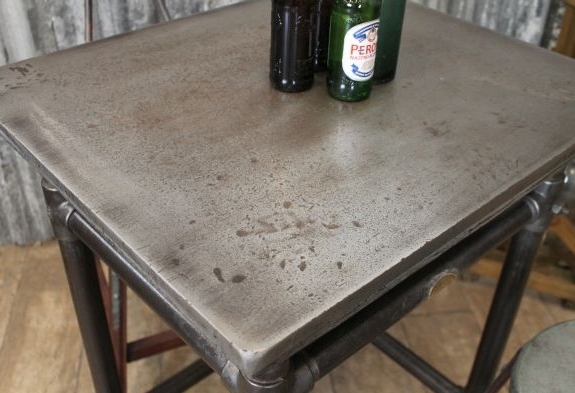 The table top does remove for ease of access. 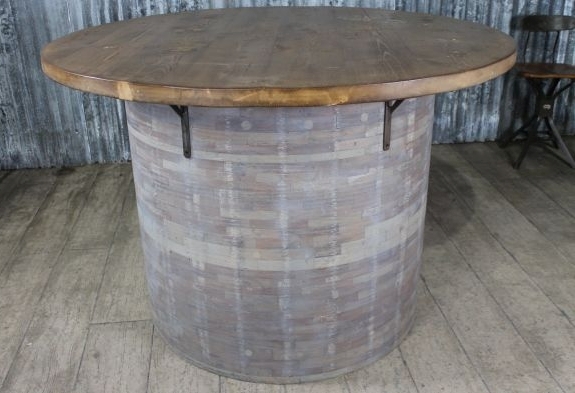 This listings is for one industrial barrel style table only, but we do have 3 available. 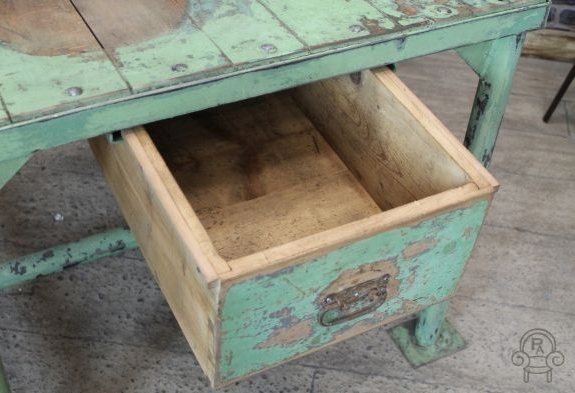 Please note that the other items displayed are not included in this listing. 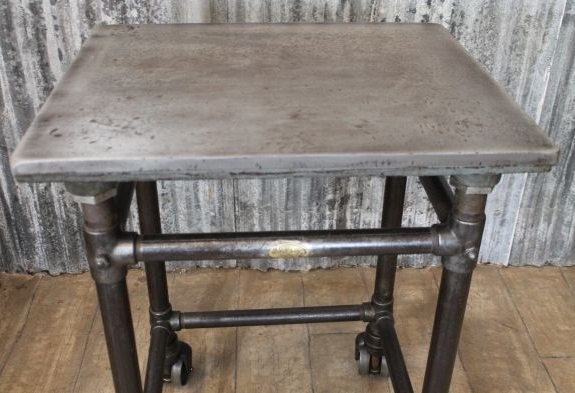 A great opportunity to purchase a superb quality classic 1940s engineering table. 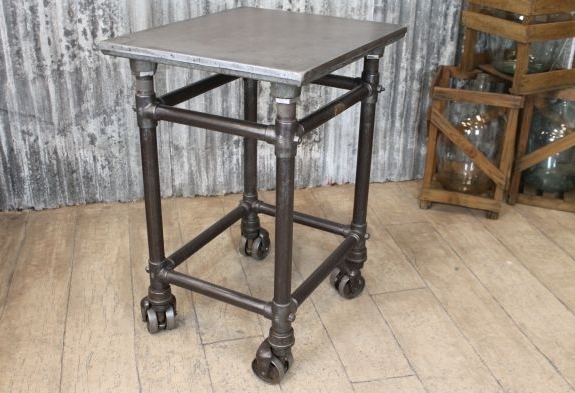 This fantastic vintage industrial engineering table has been brought back to life and would be an excellent feature piece for any restaurant, coffee shop or bar. 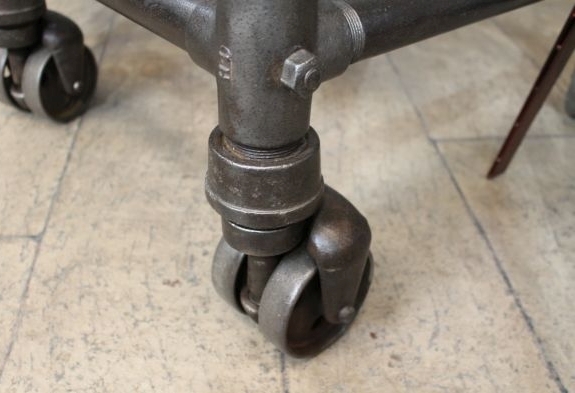 This piece of furniture is extremely sturdy and heavy, it stands on 4 double caster wheels and has a heavy tubular steel construction. 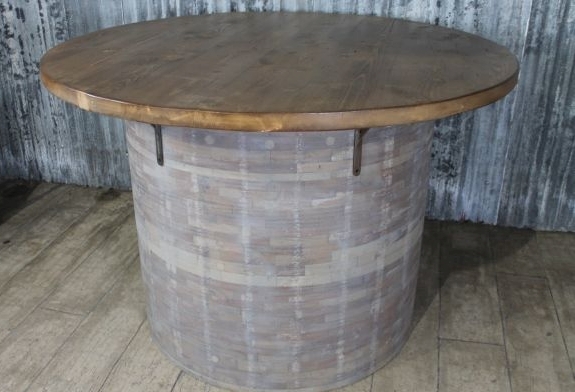 If you require a slightly larger top, we can adapt this item of furniture by inserting a bigger reclaimed pine table top; this will be at an added cost. 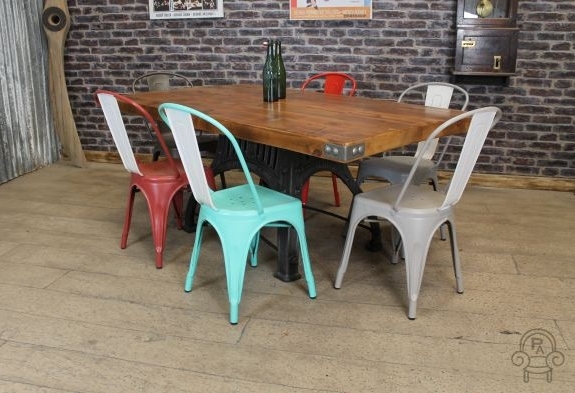 Please note, the other items displayed are not included in this listing but are available to purchase separately. 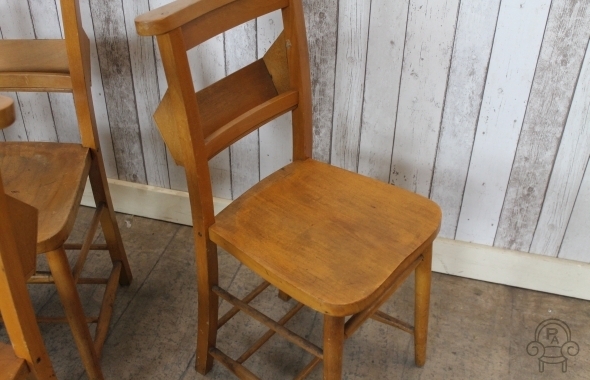 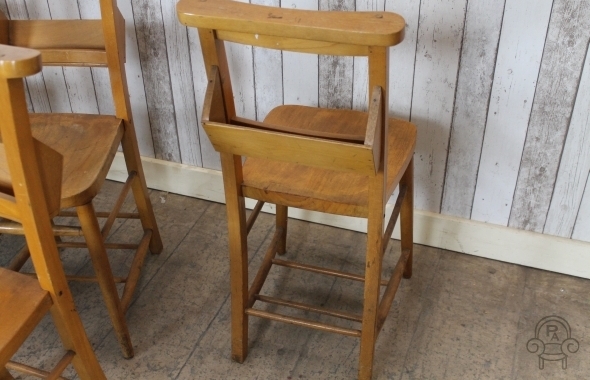 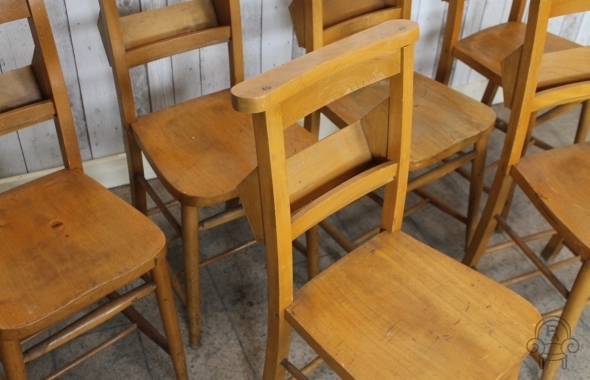 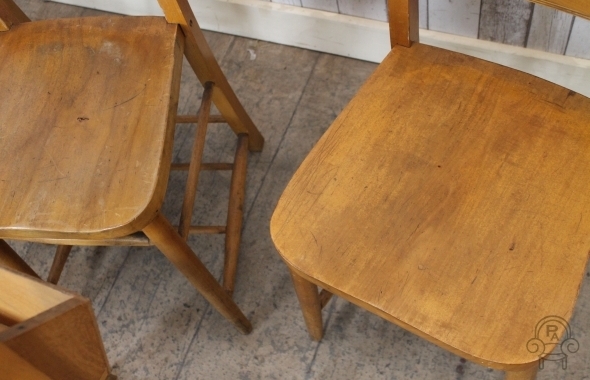 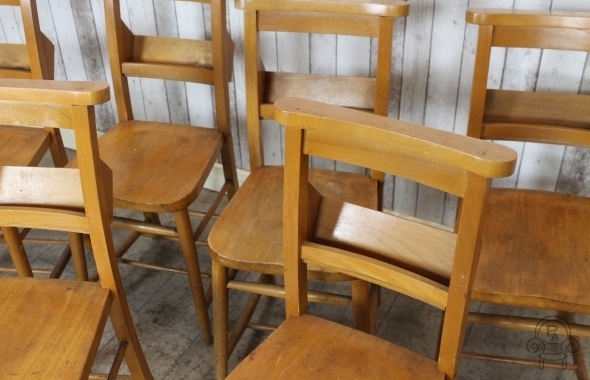 An excellent opportunity to buy a classic item of vintage haberdashery furniture. 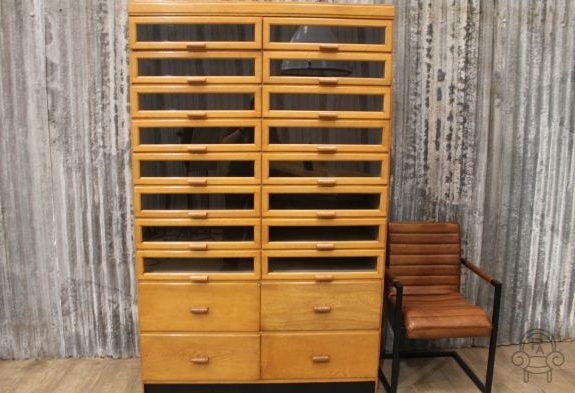 This glazed fronted, multi drawer vintage haberdashery unit would be commonly used in large shops; many of the units have been used in dressing rooms for displaying items such as ladies’ shoes. 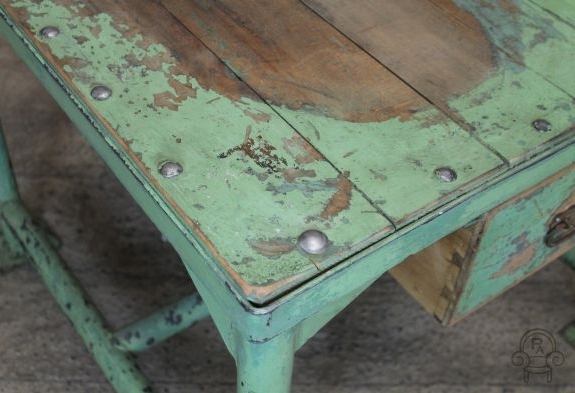 This lovely item of furniture is in excellent condition for its age. 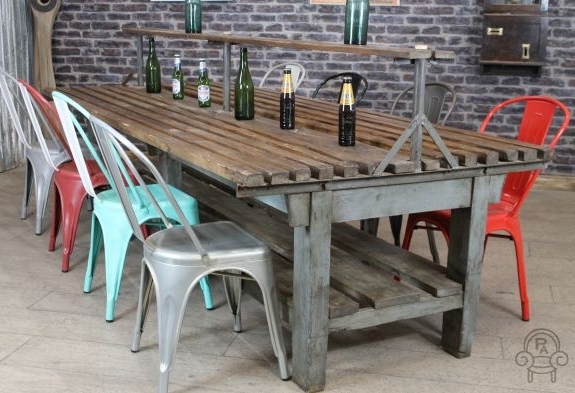 Please note, other items pictured are not included in this listing but are available to purchase separately.